FREEPORT, G.B. – August 16, 2013 — Education Minister the Hon. 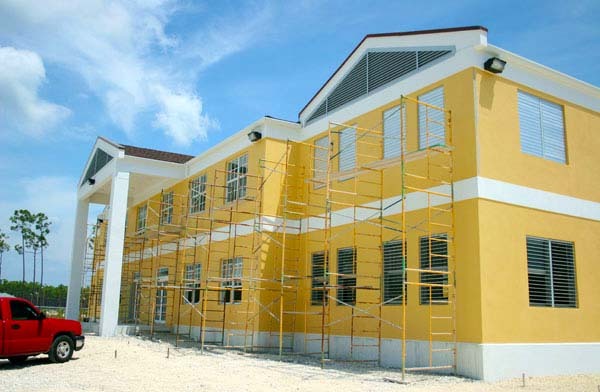 Jerome Fitzgerald said Friday, August 16, that he is pleased with the renovations being carried out to schools on Grand Bahama and that he expects a very smooth opening for government operated schools on the island. Mr. Fitzgerald, accompanied by the Minister for Grand Bahama, the Hon. Dr. Michael Darville, toured many of the schools on Grand Bahama. He was also accompanied by senior officials from the Ministry of Education, Science and Technology, and staff from the Ministry of Works. The Education boss agreed that having a Minister in Grand Bahama like Mr. Darville, who has a degree in engineering, is helpful in the oversight of the repairs. 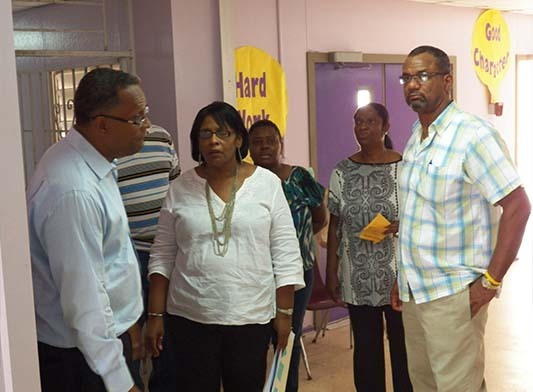 The Minister’s comments came after completing the tour of West Grand Bahama schools, where they discovered some minor plumbing and leaking issues, which he promised will be addressed. Mr. Fitzgerald noted that last year more than a million dollars was spent on Grand Bahama schools owing to a number of structural areas that needed to be addressed, and that this year the repairs to the various schools should be around ½ million dollars. Continuing, the Education Minister said they are pleased this year with what they have seen and that the Minister for Grand Bahama has been on top of things. Mr. Fitzgerald said they have been getting reports from the various schools and that judging from the report, this year there was not a need to visit all schools on Grand Bahama, as some required very little work. He said he visited schools that required more repairs. With regards to schools being ready for opening day, the Minister said that “it seems like we are not going to have any problems with that. It looks like from what I have seen by the end of next week we will be ready. On the subject of staffing the Minister informed that last year they employed some one hundred and twenty teachers throughout the Commonwealth of The Bahamas representing the largest influx of teachers they have had in the system for a very long time. “That helped to address a lot of the deficiencies that had built up over years. What happens is that today we have about two hundred trained teachers who are actually not teaching in the classroom, who are spread either with the ministry’s headquarters or in other ministries throughout the government. “There is a high demand for highly skilled technical personnel and trained teachers come with a skill set that is needed in the Public Service,” he said. The Minister noted that last year they made provisions to employ 80 teachers and that he got special Cabinet approval to hire another 120. “So in one year really, we really filled that gap with the 200 that was missing out of the school system for quite sometime. So we are as well complemented with teachers as we have been in a long time,” he said. He said he expects to see a full complement of teachers, however one can not get away from the fact that some teachers fail to show up or retire. He said thay have experienced teachers who actually break their contract on opening day. “So in those instances it normally takes us a week or so to fill those positions, depending on what it is. It may take as much as two weeks, but if it is a math teacher it could take up to a month, but those are the only challenges that we will see, but we are not going in with a shortage as we have in previous years, trying to fill the gap. “This year we have the compliment and only those who fail to up on the first day of school or couple days before, we may have an issue with, but other than that we are in very good shape,” he stressed.